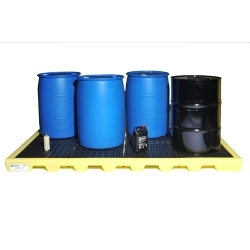 4 Drum Workstation™ with 43 Gallon Sump Capacity | U.S. Plastic Corp. There's no need to worry about incidental spills on your factory floor. 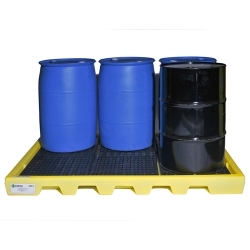 The 4-Drum Workstation™ is easy to load with a low profile design and optional ramp. Each Workstation™ is designed for stand-alone use or can connect with other Workstations™ for a customized work area. Forkliftable when empty. 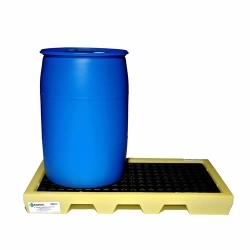 Tough, one-piece polyethylene construction that will not rust or corrode. Low-profile Workstations™ actually become part of your factory floor, optimizing space for increased safety and efficiency. Makes drum loading a snap. 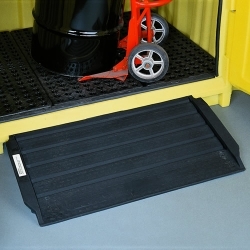 Large sump capacity catches incidental spills. 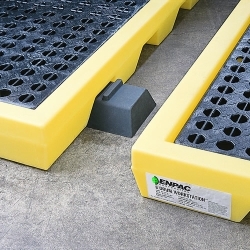 Multi-Purpose Work Ramp™ hooks onto any Workstation™ for easy loading (sold separately). 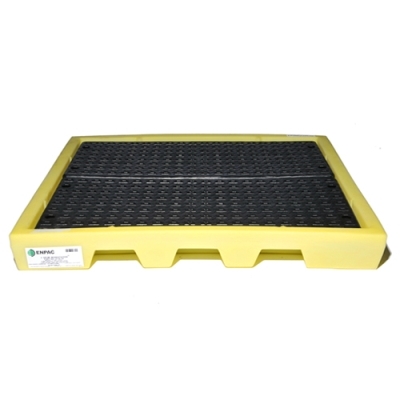 Removable heavy-duty structural foam grates for easy cleaning. Rolled-edge design helps resist cracking and warpage. Link-Locks create a solid work-space by attaching units (sold separately). Regulations: EPA, SPCC, NPDES. Weight: 70.5 Lbs. Load Capacity: 6,000 Lbs. Spill Capacity: 40 gallon. Dimensions: 53‚Äù Long x 53‚Äù Wide x 6‚Äù High.